Do you and your business “give back?” Is it possible to build a profitable business that is also socially responsible? Just ask Blake Mycoskie, he has built a profitable business that is not only socially responsible, it also gives back on a one-for-one basis and he has written a very inspiring book that encourages others to follow in his shoes. Toms Shoes that is! 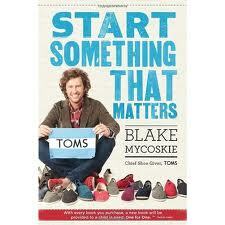 Blake is the founder of Toms Shoes and stated his company with the mission that for every pair of shoes sold; one pair would be given to children that did not have shoes. His book entitled “Start Something That Matters” details the humble beginnings of his company, how he found his mission and how he was inspired by others. Blake invited me to read his book and has given me an extra book to give away to someone that I think will make a difference. I found Blake’s personal stories both heartwarming, and very down to earth. But I don’t want to tell Blake’s story for him, I suggest that you buy a copy of his book and if you do he will also donate one book to those less fortunate. However, if you can convince me that you are sincerely interested in sustainability and corporate social responsibility, I will send the extra free copy of Blake’s book to you. Just post your 200 word or less description of how you plan to give back on my blog page at http://SustinablyVerdant.wordpress.com under the “Start Something That Matters” tab. Aside | This entry was posted in Corporate Social Responsibility (CSR),, Sustainability, Uncategorized. Bookmark the permalink. Started a new philanthropic venture that is able to sell a product/service and make the financed payments, for the buyer. This venture is able to reduce all cost to the individual, business, and organizations. A game changer and economy changer.